Does the design of the Tabernacle in the wilderness correspond to God’s blueprint of Creation? The Christian Topography, a sixth-century Byzantine Christian work, presents such a cosmology. Its theory is based on the “pattern” revealed to Moses on Mount Sinai when he was told to build the Tabernacle and its implements “after their pattern, which is being shown thee on the Mount.” (Exod. 25: 40). The book demonstrates, through texts and images, the motifs that link the Tabernacle and Creation. It traces the long chain of transmission that connects the Jewish and Christian traditions from Syria and ancient Israel to France and Spain from the first through the fourteenth century, revealing new models of interaction between Judaism and Christianity. REGISTRATION FOR THE 2013 MEETING OF THE BRITISH NEW TESTAMENT CONFERENCE in St. Andrews (29-31 August) is still open and you can book online here. Early-bird registration is open only until 30 June, i.e., this Sunday. After that the price goes up substantially, so why not register now? For you, special deal! OLD TESTAMENT APOCRYPHA WATCH: Philip Jenkins: FROM THE MOUTH OF THE MOST HIGH. I recently suggested that we should pay much more attention to the Deuterocanonical books that are no longer found in most Protestant Bibles. Partly this is because of their artistic and cultural influence, but their religious significance is immense. Two substantial “Second Canon” books in particular demand our attention, namely Wisdom (“the Wisdom of Solomon” and Sirach (Ecclesiasticus). Together with the canonical books of Proverbs and Ecclesiastes, they are major components of the once-vast wisdom literature of the ancient Jewish world, which reached its height in the last two centuries before the Christian era. YIGAEL YADIN died 29 years ago today: This day in Jewish history / An archaeologist who brought Israel's history to life, dies: Yigael Yadin helped acquire the Dead Sea Scrolls, identified the historical significance of Masada, and made Israelis feel connected to their ancient history (David B. Green, Haaretz). Photograph of the finds in the cistern: Vladimir Naykhin. Recently a small cistern belonging to a building was exposed in an archaeological excavation the Israel Antiquities Authority is conducting near the Western Wall, in the vicinity of Robinson’s Arch in the Jerusalem Archaeological Park. Inside the cistern were three intact cooking pots and a small ceramic oil lamp that date to the time of the Great Revolt. 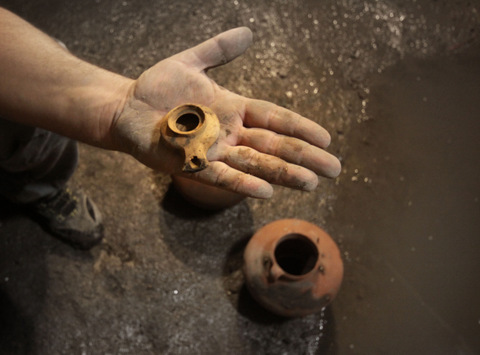 The vessels were discovered inside the drainage channel that was exposed in its entirety from the Shiloah Pool in the City of David to the beginning of Robinson’s Arch. In his book The Jewish War Josephus describes the Roman siege of Jerusalem and in its wake the dire hunger that prevailed in the blockaded city. In his dramatic description of the famine in Jerusalem he tells about the Jewish rebels who sought food in the homes of their fellow Jews in the city. These, Josephus said, concealed the food they possessed for fear it would be stolen by the rebels and they ate it in hidden places in their homes. “Many secretly exchanged their possessions for one measure of corn-wheat if they happened to be rich, barley if they were poor. They shut themselves up in the darkest corners of the their houses, where some through extreme hunger ate their grain as it was, others made bread, necessity and fear being their only guides. Nowhere was a table laid…” (Josephus The Jewish War. Translated by G.A. Williamson 1959. P. 290). That's quite a lot of narrative to get out of some pots in a cistern and an anecdote by Josephus, but maybe. Follow the link for TOC etc. and ordering information. This and other Gorgias titles are 30% off until the end of this month. For you, special deal. ROGER PEARSE: A Christian inscription from Palmyra dated 135 AD? Could be. Those two marks framing the last line certainly aren't text-speak kissy x's. I wonder what Larry Hurtado would say about them. Cross-file under "Aramaic Watch." More on Palmyra and its inscriptions here and links. MARK GOODACRE: The joy of failed predictions. Mark's track record for being ahead of the times with technology is exemplary, but he seems happy enough to have made one wrong call. It's nice of him also to flag one of my prophecies from the same era which seems to be holding up pretty well. That said, the mainstream media is still pretty resistant to correction, but I think we're even making slow progress on that front. A GROOM'S WEDDING CAKE: The Ark of the Covenant … in Cake Form! According to the excavation director on behalf of the Israel Antiquities Authority, “This is the first time we have encountered such a finely preserved section of the road in Jerusalem”. 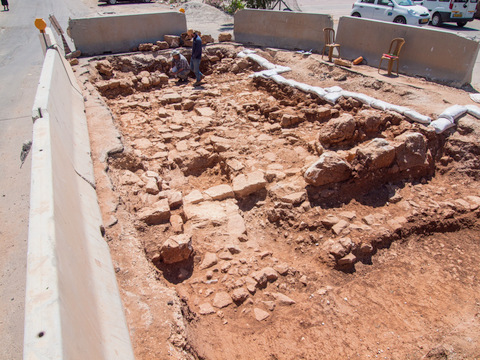 An ancient road leading from Yafo to Jerusalem, which dates to the Roman period (second–fourth centuries CE), was exposed this past fortnight in the Beit Hanina neighborhood in northern Jerusalem. The road remains were revealed in an archaeological excavation the IAA conducted in Beit Hanina prior to the installation of a drainage pipe by the Moriah Company. The road section discovered in the IAA excavations in Beit Hanina is part of the imperial network of roads that led to Jerusalem from the coastal plain. We know about these roads from both historical sources and archaeological excavations. Two main arteries led from Yafo to Jerusalem during the Roman period. One is the road that passes through Bet Horon and the other runs via Shaar HaGai. This particular segment belongs to the Bet Horon road. The road began in Yafo and passed through Lod where it split it two different directions: one to Shaar HaGai and the other by way of Modiin along the route of what is today Highway 443 to Bet Horon. From there the road continued eastward as far as Bir Nabala and turned south to Kefar Shmuel where it merged with the highlands road that led to the Old City of Jerusalem. In some places we can see that the modern Bir Nabala road was paved just a few centimeters above the route of the ancient road, which indicates that until a few decades ago the ancient road in this region was visible and was used. ARAMAIC WATCH: The Ben Yehudas of Aramaic: The one-time lingua franca of the Fertile Crescent is spoken by only 400,000 people around the world today. But efforts are being made, especially in one village in the Galilee, to ensure that Aramaic does not go quietly into the night (Dorit Shilo, Haaretz). Shady Khallul and his brother Amir have been working for years to revive the holy language of Aramaean Christians in Israel and to bring it back into everyday use. Their model, Shady says, is none other than Eliezer Ben Yehuda, father of the contemporary Hebrew language renaissance. "If you, the Jews, were able to revive Hebrew and turn it into a modern language, why can't we?" he asks. "Last year we received permission from the Education Ministry to teach Aramaic in first and second grades at the school in Jish, and we had to draft a curriculum from scratch. Amir wrote the textbooks and I traveled around the world to buy dictionaries and grammar books so that we could translate and adapt them for use in Israel. I brought most of the teaching material from Sweden, and the dictionaries from France. Most Aramaic books today are printed in Lebanon, but we have no way of bringing them in from there." Unlike biblical Aramaic, written in Hebrew letters, the modern dialect - the Western variant of which is called Syriac - is written in another ancient script, which resembles a melding of the Hebrew and Arabic alphabets. Like Hebrew, the language comprises 22 characters and is written right to left. Each of Aramaic's two principle dialects - Western and Eastern - has its own alphabet. Both, however, share a classical written alphabet, Estrangela, reserved for prayers and religious texts. The challenge before the Aramaeans in Israel, who use the Western dialect, is twofold: On the one hand they must teach their children to speak the language and persuade them to use it in their everyday lives, with family, friends and at school, and on the other hand teach them to read and write in the two alphabets (the Western and the Estrangela). More on the Maronite revival of Aramaic in Jish here and links. THIS WEEK'S DAF YOMI COLUMN BY ADAM KIRSCH IN TABLET: In the Talmud’s Timeless Laws, a Vast Temple of the Mind: Long after the Jerusalem Temple was destroyed, Talmudic rabbis kept it alive in their imaginations, and ours. All of this is remarkable, not just for its attention to detail, but because of the way the rabbis of the Talmud think about the Temple. There is no acknowledgment, in the cases of the bandage, the wart, and the hinge, that these rules apply to a Temple that does not exist. At the time the Gemara was being composed, the Temple had been gone for three centuries; most of the sages of Babylonia had never even seen the spot where it stood. Yet they continued to legislate for the Temple, to reconcile their own rules with the Temple’s rules, as if it existed in the present tense. New Zealand writer Michael Baigent, who gained attention for launching a lawsuit contending that The Da Vinci Code stole ideas from his own book, has died of a brain hemorrhage at age 65, his literary agent says. Baigent is best-known for writing the 1982 non-fiction book The Holy Blood and the Holy Grail, which explores theories that Jesus married Mary Magdalene, the couple had a child and the bloodline survives. In 2006 Baigent and co-author Richard Leigh made international headlines when they sued Dan Brown's publisher for copyright infringement, claiming that Brown 'appropriated the architecture' of their book in a high-profile London court case they eventually lost. I followed the case back in the spring of 2006. See here, here, here, here, and here. Also note here. The Genizah Psalms (MS 798 of the Antonin Collection) is a Hebrew document of messianic character, apparently presenting itself as the work of David. 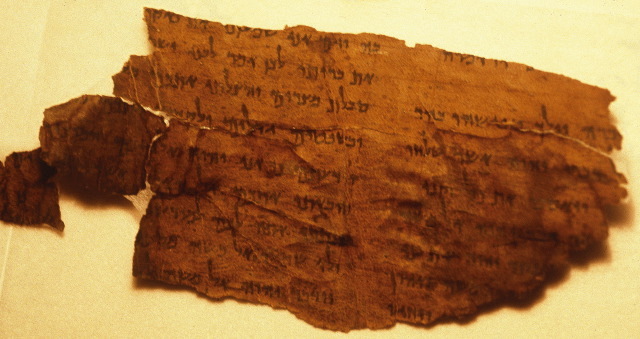 It is taken by some to date to the time of the second temple, and to be approximately contemporary with some of the literature of Qumran, while others regard it as a medieval composition. From the point of view of a classical hebraist, David M. Stec explores how this text relates to classical Hebrew literature as a whole and considers how viable it is to regard it as a genuine constituent of that body of literature. He presents an edition of the Hebrew text and English translation, together with an introduction, commentary and analysis of language. These psalms have been translated for the More Old Testament Pseudepigrapha Project by G. W. Lorein and E. van Staalduine-Sulman with the view that they are earlier rather than later. Oh, and have I mentioned that the first volume of MOTP texts is due out in September: Old Testament Pseudepigrapha: More Noncanonical Scriptures? We're currently working on the page proofs. A HUMBOLT RESEACH FELLOWSHIP has been granted to Matthew Goff: Self-proclaimed Bible nerd studies scrolls: FSU associate professor Germany-bound to continue research on Dead Sea Scrolls. I look forward to seeing his work on the giants and the Nephilim.